:: Question of the Day - What are the Colores for Fall? I've always wanted to visit India. I love the food and the women in their bright colored saris. Plus I love yoga and hope to one day go to a wellness retreat there. You can experience a little bit of India right here in Greenville! Take a yoga class at North Main Yoga and have a little Indian food as well. Yoga is an ancient spiritual practice that came from India to the West in the 1930s. Today, we think of it as a form of exercise. However, Yoga is so much more. Yoga means union. This can be the union of the body, mind and spirit or simply the union of the breath and body. The yoga of movement is traditionally called Hatha Yoga (ha= sun, tha= moon). All forms of physical yoga come under the category of Hatha Yoga. Some forms of Yoga are more physical, some more internal, and some are therapeutic for the body and mind. The type of Yoga you may prefer will depend on each individual. When picking a yoga class, first pick a time of day that works with your schedule. Try several classes at that time slot and find the one that feels right to you. It may take a few times to find a teacher and yoga style that resonates with what you are looking for. If you have injuries, be sure to tell the teacher and they will work with you along the way. The concept of 'HANDI' cooking is years and years old and has been passed from generation to generation in India. 'HANDI' means an earthen round pot in which cooking of curries takes place on slow fire. 'HANDI' comes in different shapes and sizes but the main features are common to all i.e., thick bottom to ensure that the food does not stick and consequently burn. It is world known fact that when food is cooked on a slow fire, its natural characteristic flavor, aroma and taste are all preserved to the maximum extent. Our vision is to simplify Indian cooking and bring you back to the basics with nutrition, quality, flavor, aroma and taste. our spice blends fresh ingredients and your imagination will transform your craving into simple and satisfying cuisine. A Step Above the Rest. Question of the day - What are the colors for Fall? "The Fall 2009 palette is more unique and thoughtful than the typical autumnal hues of years past," said Leatrice Eiseman, executive director of the Pantone Color Institute®. "Designers recognize the desire for fundamental basics that speak to current economic conditions, but also understand the need to incorporate vibrant color to grab the consumers' eyes and entice them to buy." A natural choice during uncertain times, patriotic American Beauty, a wonderfully balanced, true red, speaks to the need for cohesiveness. Perfect for all skin tones, American Beauty is a feel-good color. Purple Heart can be worn with all skin and hair types; works best with vibrant rich hair hues. Purple Heart connotes a sense of refinement and sensuality, adding an air of creativity and excitement to the top 10, especially when paired with American Beauty. A warmer, more subdued Honey Yellow looks fabulous with violet-ash, neutral and golden/burnished skin and hair tones. Pair with Purple Heart for a surprising flair. Or, for a more typical fall combination, group Honey Yellow with Burnt Sienna and Iron. Fall would not be complete without a seasonal favorite like Burnt Sienna, a deepened, earthy shade of orange, reminiscent of an autumn sunset. Accentuates cool skin and hair tones; heightens the warmth of all gold tones. Pair this versatile hue with Nomad and Rapture Rose for a different twist. Like the olive in a martini, Warm Olive, a rich yellow-green, adds a touch of elegance and sophistication to fall. Enlivens all skin and hair types. Strong yet understated Iron serves as the "new black," making traditional basics much more interesting. Complimentary to all hair and skin tones. Neither gray nor brown, Iron is a grounding color that coordinates well with all colors in the palette. Crème Brûlée, a grayed-down beige, is this year's white. Nomad, which bridges the gap between beige and light gray, also speak to the need for timeless neutrals. Works well with all skin and hair tones. All three classics - Iron, Crème Brûlée, and Nomad - can stand alone or serve as anchors when paired with other colors. Adding spark to the Fall palette, Rapture Rose artfully captures the vibrancy of fuchsia and the softness of pink. Underscored by nurturing and feminine tones, the addition of Rapture Rose enlivens the more traditionally subdued fall hues. Suitable for all skin and hair types; excellent with rich pastel hair colorations. Majolica Blue, a deep, mysterious teal blue with more vibrancy than the usual navy. Majolica Blue brings an exotic flair to the group, especially when paired with Burnt Sienna or Purple Heart. Makes all skin and hair tones look more vibrant; hair should be highly glossed. Check out the Pantone link below for some awesome ideas in color and style for the fall from some of top fashion designers in the country! Before the hustle and bustle of the holiday season is here, take time for yourself and do a little Holiday shopping at the same time. We'll have tons of pre-Holiday specials, and a limited number of holiday-only products! Don't miss our door prizes, yummy appetizers and lots of fun. Stop in on your way home or on your way out. This limited edition colore story was created for a universal look for the holiday season. 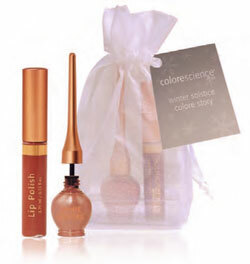 Colorescience Pro Lip Polish will last throughout a full day of shopping or a holiday party. Create a sheer-to-dramatic eye with the loose mineral Eye Genie to take you from day to night with one colore... now with pearl powder! Lip polish moisturizes and restores the look of fresh, plump lips. Free of dyes. Eye genie - pure mineral pigment shadow, no dyes. These make wonderful gifts for your friends or for yourself! Your investment in healthy lip and eye products is only $36 and comes wrapped and ready to give. A look that is really easy, and works for all eye shapes, is to start with a wash of Eye Screen* over the lid and brow, and apply an eye pencil with a fairly wide line across the lashes - my favorite for this is Shades of Grey. Using the sponge tip of the optical, smudge it over the liner, and over the lower 4th of the ball of the lid. Use a concealer-sized taklon brush to smooth out, layer a matte Genie over both, fading up and out towards the brow bone. Choose a complimentary shimmer Genie (one that is light enough to highlight) beginning at the lash line, pat and press it up the center of the lid, and feather out into a T shape, across the brow bone, towards the inner and outer corners to highlight. Apply black mascara, over Brow Fixation as a primer for the lash. Optical-After Midnight, Matte Genie-Fogs Rolling In, Genie Shimmer highlight-Bold as Brass. Optical-Dust In the Wind, Matte Genie-Caution, Genie Shimmer highlight- Cold As Ice. *The Eye-Screen is a unique new texture for the Sunforgettable collection, a loose formulation, that takes on a texture more like a primer, as it's moved and warmed up by the skin. It's designed to diffuse undereye darkness and lines, as well as provide an S.P.F. 30 for the delicate eye area. Like the sunscreen powder, you can of course can apply it on top of anything, for additional protection during the day.